Wolf Kahn, Harbor Sentinels, oil on canvas, 24 x 28″. ACME Fine Art is proud to announce the gallery’s Fall exhibition: WOLF KAHN: EARLY WORK. The exhibition will focus on a single decade of Kahn’s early career, the 1960s. This was an important decade in which Kahn’s work garnered the critical acclaim that helped establish his trajectory towards becoming one of America’s favorite contemporary landscape painters. The exhibition will feature fifteen works—fourteen oil paintings and one pastel—that demonstrate Kahn’s artistic arc during this pivotal decade. 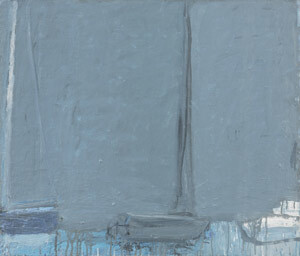 Many of the canvases have not been exhibited since the year that they were created. The show will open on Friday, 30 September, and run through 26 November, with an opening reception held Friday, 7 October from 6:00 to 8:00 in the evening. In 1960, Kahn’s work was featured in the Whitney’s Young America: 30 Painters under 36, a success that was shortly followed by Fullbright and Guggenheim fellowships. The distinct new directions he explored during this time were a sharp departure from his previous work and generated new critical attention. During this period, Kahn summered in Martha’s Vineyard and Maine and traveled to Venice, Rome and Milan. The paintings in ACME’s exhibition track these travels, and feature views of coastal Maine, sailboats off Martha’s Vineyard, and copses and clearings in the Italian countryside. These environments prompted Kahn to develop new ways of approaching color, depicting space, and conveying light. Perhaps: The minimalist and subtle, yet inventive and energetic landscapes that resulted are wholly successful in their own right. When seen from our contemporary vantage point, however, they also offer valuable insight into the genesis of Kahn’s celebrated signature aesthetic. By 1956, Kahn’s unique artistic voice was already beginning to evolve. He spent another summer in Provincetown, where, by way of his girlfriend and fellow artist, Emily Mason, he met Milton Avery and his family. While Kahn’s paintings maintained his characteristically deft balance of color, planes in his work began to smooth, brushstrokes elongated and softened, and forms became simpler. While his summer in Provincetown certainly prompted some change, a move to Venice in 1958 was the true catalyst that launched a new evolution in Kahn’s painting. In 1962, Kahn received a Fullbright Fellowship and returned to Italy, this time residing in Milan, Viterbo and Rome. Justin Spring described Kahn’s paintings of that year as “cerebral”: they play visual games with the observer. One can see the old Hofmann concept of “push-pull” come back into play in one painting from this period titled Cypress Rows, as Kahn harnesses shifts in tonality and color to create the recession of space between the frontal cypress trees that push forward toward the observer. All this dynamism is held within a palette of dimly gray blues, greens and cleverly placed white. From there Kahn’s paintings would grow into the vibrant banded landscapes and barns for which he is best known today. Looking back at his work of the midcentury, one can see how Kahn developed the adept sense of color seen today in his joyous landscapes. The 1960s proved to be an important step in this process: the decade was a successful one for Kahn, whose work of the time was featured in a number of exhibitions and gained him two prestigious fellowships. He was producing some on his most abstract works and with them, he challenged the boundaries of landscape painting and developed sophisticated and subtle color relationships that remain captivating decades later. The upcoming exhibition will provide a chance to look back on this important period, an opportunity that is typically rare during career of a contemporary artist. WOLF KAHN: EARLY WORK will open Friday, 30 September and run through the end of ACME’s Fall season to close on 26 November. An opening reception will be held from 6:00 to 8:00 pm on Friday, 7 October. This July, ACME Fine Art will once again host their ever-popular Summer Salon exhibition. The show will open on 8 July 2016, with a reception on Friday, 5 August from 5:00 to 8:00pm. The exhibition will be on view through Saturday, 20 August. The upcoming exhibition will include pieces by almost every artist represented by ACME, and a variety of summer themed artworks from the 20th century. Hung salon-style throughout the gallery, the show promises an exciting variety of work produced at some of New England’s most renowned summer art colonies. Filling the walls with works from across the decades provides a unique opportunity to see the evolution of favorite genres and media. To this end, the exhibition will include a grouping of still lifes by such artists as Jack Tworkov, Karl Knaths, Lillian Orlowsky, Dorothy Eisner, Charles Littler, James Lechay, and Herman Maril, each masters of the genre. Other highlights include a striking 1932 abstract by WPA artist Ross Moffett, which appeared in the 1994 exhibition of the Penny and Elton Yasuna Collection at the Provincetown Art Association and Museum. The 1930s were an important period for Moffet, during which he received recognition as a leader of American Modernism. In his catalog essay for the exhibition, Tony Vevers notes that Moffet “strove for an effect in which man and his surrounding are interlocked, producing a depth of insight and psychological penetration,” which gained the artist critical praise and numerous awards. The Moffett piece will appear alongside important abstractions from the 2015/2016 gallery season, including works by Haynes Ownby, George McNeil and Richard Filipowski. The selection of works on paper in the exhibition will demonstrate the versatility of the medium with drawings by Hans Hofmann, two beautiful landscapes by Howard Gibbs, and compelling city scenes by Joe Solman and Maurice Freedman. Sculpture by Ilya Schor, Resia Schor and Gil Franklin will also appear in the show, as well as work by contemporary painters Rose Basile, Myrna Harrison and George Lloyd. ACME Fine Art’s 14th Annual SUMMER SALON will open on Friday, 8 July 2016, with an opening reception on Friday, 5 August in conjunction with SoWA’s First Friday. The exhibition will also be viewable on the gallery website: www.acmefineart.com. Please contact the gallery at 617.585.9551 or info@acmefineart.com for further information about exhibitions and/or artists. Summer Gallery Hours are 11:00 a.m. to 5:00 p.m. Wednesday through Saturday. On 15 April 2016 ACME Fine Art will open a new online-only exhibition of lithographs by George McNeil. Today McNeil is well recognized as one of the few true first-generation Abstract Expressionist painters. However, McNeil’s legacy in modern art began long before his participation in the advent of the New York School. Among his other early noteworthy accomplishments, McNeil was one of the founders of the American Abstract Artists group in 1936, and in 1939, McNeil was one of only five non-objective artists whose work was selected for the New York World’s Fair exhibition. The artistic training McNeil received set him up well for these early accomplishments. His studies at the Art Students League (from 1927-1932) introduced him to Vaclav Vytlacil, Jan Matulka, and most importantly, Hans Hofmann. McNeil became closely associated with Hofmann during this period and from 1936 to 1937 McNeil acted as Hofmann’s class monitor, official assistant, and unofficial interpreter of Hofmann’s theories. (An often-repeated story about McNeil’s role as interpreter is that when Lee Krasner was asked what she thought of Hofmann’s theories, she responded that she could not say, because all she really understood was McNeil’s version.) The collegial atmosphere of the Hofmann School helped foster his lifelong friendships with artists such Giorgio Cavallon, Mercedes Matter, John Opper, William Freed, Lillian Orlowsky, and Rae Eames. Similarly, McNeil’s participation in the Federal Arts Project in the 1930s led to associations with Burgoyne Diller, Willem De Kooning, and James Brooks. In the late 1940s, McNeil joined the Charles Egan Gallery in Manhattan, which was one of the first galleries in New York to feature the work of Abstract Expressionist artists. During this time, Egan was also showing the work of Willem De Kooning, Franz Kline, Giorgio Cavallon, Philip Guston, and Robert de Niro Sr. In 1950, McNeil had his first of four solo exhibitions at the Charles Egan Gallery. Since that time McNeil’s work has been widely exhibited in galleries, private collections and museum venues alike. McNeil’s work is now in the permanent collections of the Metropolitan Museum of Art, the Museum of Modern Art, the National Gallery of Art, the Whitney Museum of American Art, the Brooklyn Museum of Art, and the Corcoran Gallery of Art. The lithographs to be included in the exhibition at ACME demonstrate the accuracy of this statement: all have the fervent energy that also appeared in McNeil’s paintings of the period. The exhibition focuses on lithographs produced in the 1970s and 1980s, when figuration had returned to play a prominent role in McNeil’s work. McNeil himself observed an important relationship between his printmaking and the evolution of his painting. Lithography, he observed, “contributed to the reinforcement of subject matter” in his work. The majority of works included in the exhibition feature individual or pairs of figures that investigate the psychological issues in which McNeil was so interested in during this period. 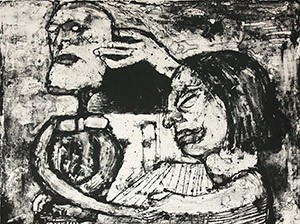 “Cigaret Head,” which will appear in the exhibition, is an excellent example of McNeil’s approach to printmaking in the in 1970s. This lithograph was also included in the Montclair Art Museum’s exhibition of McNeil’s prints and demonstrates McNeil’s painterly command of the printmaking process. The skull like figure is defined in black, with an almost imperceptible dark blue that appears along the jaw line, lips and right eye. The surface of the face itself is modulated with various splashes of diluted ink that carry the freedom and energy of McNeil’s painting. In her review of the Montclair exhibition in 1991, Vivien Raynor, a critic for the New York Times, called these monotone prints “dazzling”. The online exhibition will be viewable starting on 15 April 2016, on the ACME Fine Art website. For more information please contact the gallery at info@acmefineart.com or 617-585-9551, or visit acmefineart.com. ACME Fine Art’s forthcoming exhibition, titled LESTER JOHNSON IN PROVINCETOWN, traces the relationship between one of America’s pre-eminent Figurative Expressionist artists, and the place that has been called the most important summer art colony in America, Provincetown, Massachusetts. The watercolors and ink works making up the exhibition were selected from the artist’s estate by Gallery Director David Cowan. Collectively they chronicle Johnson’s response to the landscape that surrounded him during his summers in the art colony during the 1950s, and reveal how the sights of Provincetown informed the development of his unique and important visual voice. In the 1950s, Abstract Expressionism, as the dominant movement of the time, drove the direction of the New York art scene. 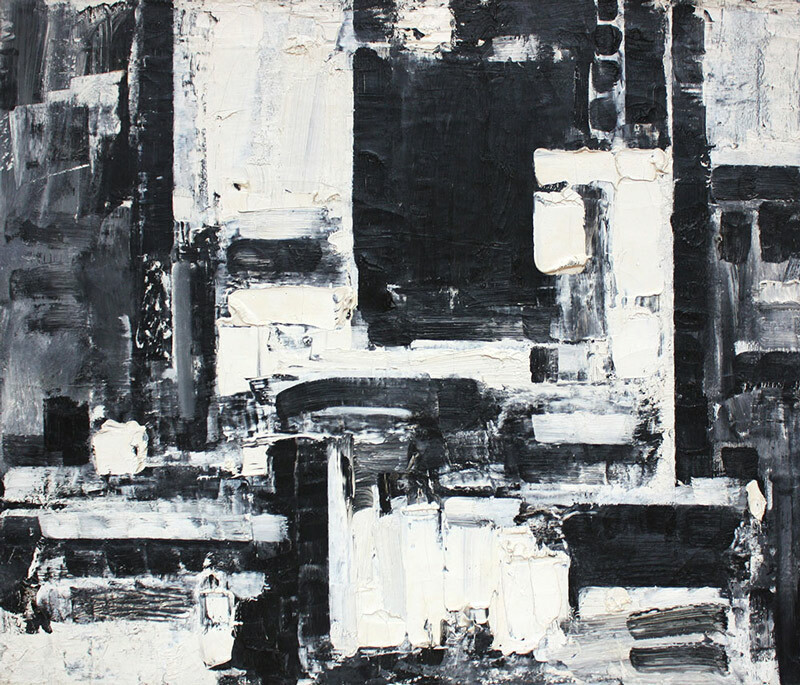 Lester Johnson was one of a few artists to deviate, and resist the pull towards the completely non-objective, painterly abstraction that had become mainstream in Manhattan. Instead, his focus became the human figure, and he harnessed the visual language of the Expressionist movement to produce works of bold, unflinching energy and strength that ultimately made him famous as one of the premier artists of the Figurative Expressionist Movement. There was little space for these renegade artists within the New York gallery scene, which remained focused on non-objective painting, and subsequently, the emerging Pop-Art movement. Provincetown, with its long history as a refuge for avant-garde communities and artists, became a natural gathering place for these figurative painters. The beauty of the landscape, paired with the low rents and ready availability of part time jobs supporting the tourist industry, made the art colony an attractive option for artists who had yet to find commercial success. Thus, Johnson, and other artists like him, including Bob Thompson and Jan Muller, escaped the city and returned each summer to Provincetown. A new venture, named “The Sun Gallery,” located at 393 Commercial Street, became the locus around which this new experimental group of painters formed. There, the owners, artists Dominic Falcone and Yvonne Anderson, were dedicated to new art that ventured beyond the limits set by Abstract Expressionism. Johnson spent summers there from 1951 to 1961, and in 1957 the gallery recognized him with a retrospective exhibition that tracked the evolution of his mature style. The upcoming exhibit at ACME Fine Art also looks to reflect on Johnson’s years in Provincetown. Many of the watercolors collected for this exhibition have never been shown before, and present a unique opportunity to tie Johnson’s stylistic development directly to the landscape that surrounded him during those formative years. In these works, the piers and many boats that crowded Provincetown harbor are depicted with a kind of primal, gestural line that came to define his later figures. The black and white ink landscapes, including the crowded and dark Landscape with Boat, foreshadow the psychological content of his later work. Others, such as Ocean, showcase Johnson’s brilliant handling of color and interest in pattern, which reemerged in his work in the 1970s. LESTER JOHNSON IN PROVINCETOWN will open on 20 May 2015, and be on view in ACME Fine Art’s 450 Harrison Street gallery until 2 July 2016. This special exhibition is being mounted as a benefit for the Fine Arts Work Center in Provincetown, MA. The Fine Arts Work Center is a nonprofit organization dedicated to encouraging the growth and development of emerging visual artists and writers and to restoring the year-round vitality of the historic art colony of Provincetown. A portion of all sales proceeds throughout the duration of the exhibition will be donated to the Fine Arts Work Center. A special ticketed Preview Event will be held on Thursday, 19 May, from 6:00 to 8:00 p.m, with cocktails and nibbles provided by MAX Ultimate. Tickets will be available for purchase through the Fine Arts Work Center at web.fawc.org. ACME Fine Art is pleased to announce our upcoming exhibition of work by Herman Maril, opening on 18 March 2016. This will be the third exhibition at ACME dedicated to this critically acclaimed artist, and will comprise a concise selection of paintings spanning the artist’s six-decade long career. Herman Maril developed his signature lyrical and pared-down style early in his career. The works created in his last years at the Maryland Institute College of Art already display his acute ability to strip away unnecessary details and create a unified and balanced composition. Early in his career, the influence of Cubism—the work of Gris and Braque in particular—is evident. Soon, however, Maril developed his own modern idiom, one that has captivated critics and viewers throughout the decades. Among the selection that will appear in the exhibition is a small, yet important, cityscape, entitled Viaduct, that Maril completed early in his career. The petit scene highlights Maril’s compositional ability, as he creates a dynamic and complete landscape, while referencing only simple shapes in a small format. Maril’s later domestic scenes have a comfortable joy and nostalgia to them. “The Telephone” is one such work. The composition is deceptively simple, but well balanced. Maril’s skill as a colorist is on prominent display in this work: the broad expanse of wall that dominates the composition oscillates with delicate, subtle shifts in color. Maril’s work was first brought to public prominence when, after a chance meeting on Cape Cod in the 1930s, Duncan Phillips became one of Maril’s most significant patrons. Today the Phillips Collection holds thirteen paintings by Herman Maril. In addition to the Phillips Collection, Maril’s work is in the permanent collections of the Metropolitan Museum of Art, the National Portrait Gallery, the National Academy of Design, the Whitney Museum of American Art, the Corcoran Gallery of Art, and the Baltimore Museum of Art, as well as many others. The centennial of his birth was commemorated with exhibitions at the Walters Museum of Art, Baltimore; the Provincetown Art Association and Museum on Cape Cod and the Ward Museum at Salisbury University in Maryland. Both Maril’s exceptional continuity of vision and his fascinating evolution as an artist will be apparent in the upcoming exhibition at ACME. The show will draw works from all periods of the artist’s life, from the early 1930s to the 1980s. HERMAN MARIL opens at ACME’s 450 Harrison Street gallery on 18 March 2016, with an opening reception to be held in conjunction with SoWa’s First Fridays on April 1st. The exhibition will also be viewable online at acmefineart.com. Opening Reception: Friday, 5 February from 5:00 to 8:00 pm. An exhibition of newly discovered early oil paintings by noted mid-century modern artist Haynes Ownby will open at ACME Fine Art on Friday, 29 January 2016. 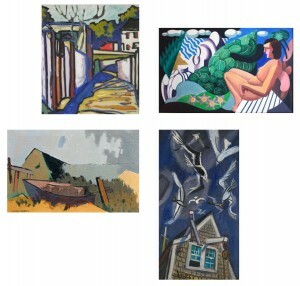 The six paintings that comprise the exhibition date from 1954 and 1955. They were made towards the end of Ownby’s affiliation with the Hans Hofmann School of Art. They are bold, spontaneous expressions in the newly found visual voice of this little known, but highly regarded, New York School artist. While still a student at Southern Methodist University in Texas, Ownby found the work of Piet Mondrian and Pablo Picasso to be his most important artistic influences. However, the first-hand instruction of Hans Hofmann, and mentoring by his good friend and fellow Texan Myron Stout in the 1950s must also be acknowledged as touchstones in all of his work. With one exception—a canvas that is a classic example of Hans Hofmann’s limited palette study—the paintings that make up this exhibition are entirely in black and white. This high contrast idiom served Ownby well, and for him it became a hallmark, much as it did for Stout. Ownby’s artwork is represented in the permanent collections of the Dallas Museum of Art, the El Paso Museum of Art, the Cape Cod Museum of Art, and the Provincetown Art Association and Museum. It has also been included in exhibitions at the Pennsylvania Academy of Fine Art, the Contemporary Arts Museum in Houston, and at the City Gallery of Copenhagen. Ownby received grants from the Florsheim Art Fund in 1996 and 1999, and from the Pollock/Krasner Foundation in 2000. ACME Fine Art’s exhibition HAYNES OWNBY: Paintings from 1954 & 1955 will be on view from 29 January to 12 March 2016. An Opening Reception will be held in conjunction with First Fridays on Friday, 5 February from 5:00 to 8:00 p.m. The entire exhibition will also be viewable on line at www.acmefineart.com. For more information about the exhibition or the artist please contact the gallery. 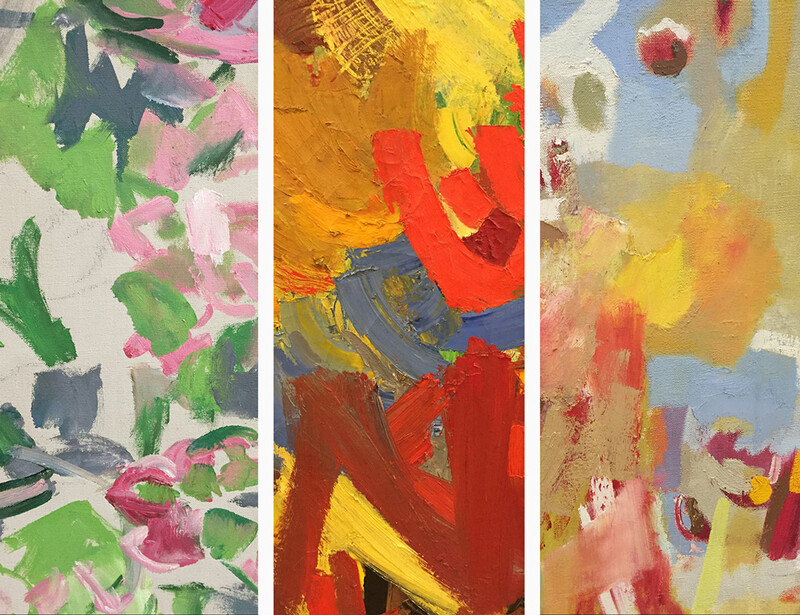 ACME Fine Art’s upcoming exhibition will present the mid-twentieth century Abstract Expressionist work of three artists: Dorothy Eisner, Myrna Harrison and Lillian Orlowsky. Eisner, Harrison, and Orlowsky were among the primary participants in the new modern art movement and witnessed the coalescence of the New York School. Orlowsky studied with Hans Hofmann in the early days of his school in New York and Provincetown. Harrison studied with Hofmann, Tworkov and Guston, and Eisner studied with Jack Tworkov. All three exhibited their work at an early cooperative gallery in Manhattan called the James Gallery. These three women operated at the center of the New York Abstract Expressionist movement, and took that mode of expression with them as they traveled to Provincetown, Maine and beyond. Side by side, their work illuminates how three artists took unique ownership of the movement’s bold new energy. Dorothy Eisner (1906-1984) had already established a career for herself as an artist long before she was introduced to Abstract Expressionism. In the 1950s, in the midst of painting in Montana, Eisner returned to New York to study with Jack Tworkov, one of the founders of the New York School. Eisner found his training compelling, and remarked “Abstract Expressionism made me think differently. I learned from it a language of shapes and color that I was not conscious of when I was young.” Her paintings from this period exhibited at ACME harness the bold, fast brushstrokes of Expressionism to capture her experience in the Montana landscape. These expansive, immersive compositions are the most fully abstract of all Eisner’s work. From that point on, Eisner incorporated the Abstract Expressionist mode into her personal aesthetic as she returned to the subject matter that had captured her attention at the beginning of her career: people. Mary Ann Caws, an art historian and literary critic, remarked in her remembrances of Eisner at Cranberry Island that Dorothy “never lost sight of who’s in charge.” She astutely adapted the new mode of expression to her personal vision, creating energetic and inviting images of the people and places that surrounded her. Lillian Orlowsky (1914-2007) also studied closely with Hofmann, and overlapped with Harrison during her time at the Days Lumberyard Studios in Provincetown. Orlowsky began studying with Hofmann in 1937, the same year that she entered into the WPA, which only accepted a limited number of abstract artists (and an even more limited number of women). Through the school and the WPA, Orlowsky met and exchanged ideas with other prominent Abstract Expressionists. To hear her tell it, Orlowsky studied with Hofmann “for a lifetime.” She recounts that he taught her to “experience what I see and transform it on a two-dimensional plane, this three dimensionality.” The paintings from the 1950s included in this exhibition demonstrate how well Orlowsky adapted Hofmann’s teachings and achieved her aim. They play with a diffuse sense of depth and movement, with areas of color applied freely over the canvas. Orlowsky dedicated much of her life to championing the work of her fellow artists and teachers, but maintained a striking independence in her own work. Somewhat belatedly, her work has come to find its own champions. Since her first solo show in 1985, Orlowsky’s work has been the focus of ten additional solo exhibitions. In this group show ACME hopes to further illuminate her distinct achievements alongside those of her contemporaries. Eisner, Harrison, Orlowsky will be on display in ACME Fine Art’s gallery at 450 Harrison Avenue from 29 January through 12 March 2016. An Opening Reception will be held at the gallery on Friday, 5 February 2016 from 5:00 to 8:00 in the evening. In addition, the gallery will be hosting a special Gallery Talk on Saturday, 20 February at 2:00 pm, featuring a panel that will include Myrna Harrison; Christie McDonald, author of Painting My World: The Art of Dorothy Eisner and Christine McCarthy; Executive Director of the Provincetown Art Association and Museum. The event is open to the general public at no charge. The exhibition will also be viewable on the gallery’s website: www.acmefineart.com. For more information about the exhibition and featured artists, please contact the gallery at info@acmefineart.com or 617.585.9551. Edwin Ambrose Webster was born in Chelsea, Massachusetts, and grew up in the suburbs of Boston. He attended art school at the Museum School, where he studied under Edmund Tarbell and Frank Benson. Webster then followed in the footsteps of his teachers and went on to study at the Academie Julian and with Albert Gleizes in Paris for two years (1896-1898). These teachers, and his experience overseas, set Webster on the path to becoming the vanguard Modernist that he is known as today. 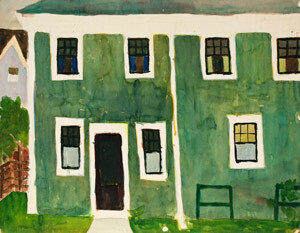 Webster was one of the first artists to settle in the now famous art colony of Provincetown. Struck by the quality of the coastal light, he took up residence there after returning from France in 1898. Shortly after, he began to teach summer classes, which quickly grew in popularity. In the winters, he traveled to the tropics and Bermuda, where he painted some of his most impressive and daring landscapes. Following his Fauvist works, Webster began an exploration of Cubist techniques. He continued exploring this mode of representation until his death in 1935. His school he continued to run until 1934, inspiring the careers of numerous young artists in these later years. One of these students, an artist named Kenneth Stubbs, was particularly close to Webster. Stubbs recognized Webster’s genius and appreciated the analytical process with which he approached these new cubist inspired compositions. He once said of Webster: “He was by far the most inspiring teacher I had.” After Webster’s death, Stubbs remained an ardent admirer and organized a series of exhibitions of Webster’s work. These shows led to numerous private and museum purchases, and a new recognition of Webster’s contributions to the development of Modern art. Now the Stubbs’ collection continues to provide a unique and insightful view into the work of Ambrose Webster. 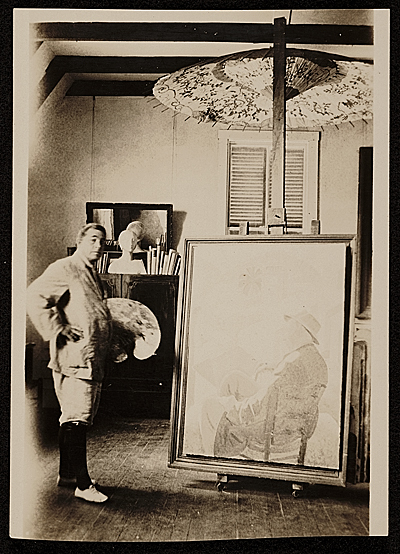 Image: Edwin Ambrose Webster painting in his studio, 192-? / unidentified photographer. Edwin Ambrose Webster papers, 1804-1970. Archives of American Art, Smithsonian Institution. An exhibition of paintings by 20th Century Expressionist master Maurice Freedman will open at ACME Fine Art on Friday, 6 November 2015. A reception in conjunction with First Friday festivities will be held from 5:00 to 8:00 that evening. The thirteen canvases selected from the artist’s estate for the exhibition by Gallery Director David Cowan demonstrate the broad range of subject matter, vibrant palette and spatially complex compositions that are hallmarks of Freedman’s best work. 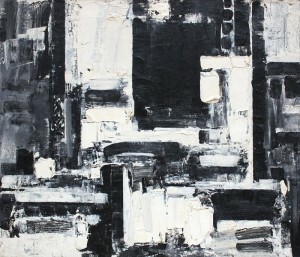 The group includes Landscapes, Seascapes, Cityscapes, Still Lives and Interiors that were painted between 1947 and 1969. They hang together harmoniously—conveying the sense of a specific locale while capturing a particular moment in time—thanks to the consistent clarity of vision and articulate expression of the artist. The exhibition will be on view through Saturday, 12 January 2016, and can be seen online at www.acmefineart.com. Maurice Freedman was a Boston native who studied at the School of the Museum of Fine Arts, Boston and at the Massachusetts Normal School of Art (now Massachusetts College of Art) before moving to New York City in the late 1920s. Freedman studied briefly at the Art Students’ League in New York before moving to Paris, where over the course of three years, he studied with Andre Lhote, Amedee Ozenfant and Ferdinand Leger. Freedman’s mature work did reflect these early influences to some extent; however, his simpatico with the work of his friends and colleagues, Marsden Hartley and Max Beckmann might be more obvious. Regardless of influences, Freedman’s voice was distinct and unique. Stylistically his work is hard to categorize, much like that of his other well-known friends Milton Avery and Karl Knaths. Even at an early age, Freedman’s richly colorful, wildly expressive canvases were at once both modern and accessible. Positive critical response to his work came soon after his return to the U.S. In 1934, one of Freedman’s paintings was included in the Pennsylvania Academy of Fine Arts Annual Exhibition, and in the same year he signed with Midtown Galleries in Manhattan. Since that time, his work has been included in museum exhibitions at the Carnegie Institute, the Metropolitan Museum of Art, the American Academy of Arts & Letters, the Washington University Art Gallery and the Corcoran Gallery of Art (now part of the National Museum of American Art, Smithsonian Institution). The most recent solo exhibition of Freedman’s work in a museum setting was this summer at the Provincetown Art Association and Museum. Today Maurice Freedman’s work is in the permanent collections of the Brooklyn Museum, Carnegie Institute, the Pennsylvania Academy of Fine Arts and the National Museum of American Art, Smithsonian Institution. ACME Fine Art’s exhibition, MAURICE FREEDMAN: TIME AND PLACE will be on view from 6 November 2015 to 12 January 2016 at 450 Harrison Avenue in Boston, and online at www.acmefineart.com. Please contact the gallery with questions about the artist, or the exhibition.